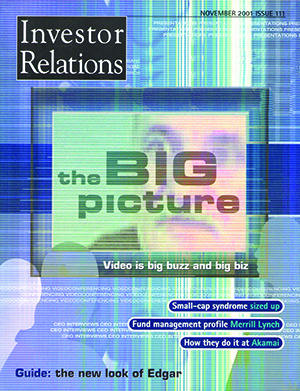 Two months after the attack on the World Trade Center on September 11, 2001, IR Magazine’s November issue cover feature was The Big Picture. The cover image evokes the sinister grain of the magnetic tape still in use at the time on which the horror of that day was recorded and broadcast, but it was not chosen merely to reflect troubling times. US airlines reported a 30 percent fall in passenger traffic in the weeks following the attack, as companies curtailed air travel by employees. At the same time, videoconferencing soared by 40 percent, with the California-based TeleSpan Publishing reporting increases of as much as 100 percent among some service providers. The correlation of war with use of the video medium is a recurrent theme of the late 20th century: a similar spike was recorded during the Gulf War, according to Elliot Gold, then TeleSpan’s president (he retired in 2013). These same weeks wreaked havoc for IR professionals who found their schedules upset by cancellations of one roadshow meeting after another. The only alternative was to meet investors virtually. Common standards adopted in 1990 had driven sales of videoconferencing systems from just a few thousand to almost 90,000 per year by 2001, and pretty soon most business offices had rooms specially fitted with a big screen and programming unit. The comparatively high cost of physical roadshows made the videoconferencing alternative a no-brainer for early adopters but others questioned the value they were getting from systems costing thousands of dollars, which then proved difficult to use in practice. One analyst, taking drastic action for the time, left work where she could not hear a webcast to listen to it instead on her computer at home. Some investors saw videoconferences as a clever tool with which to do their own detective work. Tim Linacre, then managing director of technology investment banking at WestLB Panmure in London, recalls his suspicion at rewatching a recorded video presentation on mute in which the CEO’s body language suggested all the signs of a person lying. A few months later, the same company issued a profit warning. Video was making conference calls easier and cheaper, but had also made deceit easier to spot and analyze. One of the flagship innovations developed by artificial intelligence engineers today is the machine that can read these signs in human facial expressions. In June 2015, IR Magazine reported on perhaps one of the most successful uses of modern videoconferencing, which involved Deutsche EuroShop’s use of the free mobile app Periscope. Proposals to use traditional live-streaming techniques had been made and swiftly thrown out by the company on the basis of cost. By contrast, Periscope allowed investors and analysts to watch the firm’s incoming and outgoing CEOs give speeches at its AGM – for free. A leap forward to August 2017 contrasts this with the latest in virtual technology. In August last year, IR Magazine delved into the use of virtual reality (VR) by non-profits to give potential donors a more immersive experience. An example of this is the ‘empathy machine’ used by the Clinton Foundation, which transports investors via headset to the plains of East Africa alongside Bill and Chelsea Clinton. This model has since been imitated by Alzheimer’s Research UK, Amnesty International UK and Pencils of Promise – which raised $2 mn at one fundraiser when it launched its VR video. In August 2017, only one company had taken the lead from non-profits and experimented with virtual reality as a tool for investor relations or corporate governance, but the article resonated with readers at subsequent events. Augmented reality (AR) – technology that superimposes images generated through a computer onto the user’s view of the real world – has even bigger potential for investor meetings: GE’s mechanics and engineers have seen an 8 percent to 12 percent productivity boost from using the technology, according to the article. T-Mobile hosts regular ‘behind the scenes’ earnings calls with investors in a fashion described by IR Magazine as like ‘a radio phone-in’. These real-time meetings frequently fetch up to 20,000 hits on YouTube and hold clues to how such technologies could erode the barrier between the private and public spheres, opening the closed-door world of corporate meetings to the eyes and ears of a mass online network. Episode 93 of IR Magazine’s Ticker podcast, uploaded in October this year, looks at examples of VR that could reshape practices in IR in future, such as company site visits. An investor can, for instance, use a VR headset to walk through a company’s plant facility alongside its IRO as its guide. The images presented are not computer simulations – Radek Barnert, CEO of WeConvene, says on this episode of The Ticker that the point of the experience is to place the investor in the exact location where it wishes to ‘kick the tires’. ‘If you’re able as an investor relations officer to host a walkthrough with 30 people… you’re saving everyone cost and time… it’s much better for the environment… and for an IRO, this is a very efficient way of getting people into the production room to experience firsthand what they are investing in,’ he says. The impact of Mifid II, which already suggests investor meetings will require more budget for longer travel times, may lead to further adoption of videoconferencing technology, yet with modern life already saturated with AR, a counter-emphasis on interpersonal exchange seems just as likely. One thing is certain: the big picture, just like the world itself, is only getting smaller.